Welcome to Red Oak Art Studio. 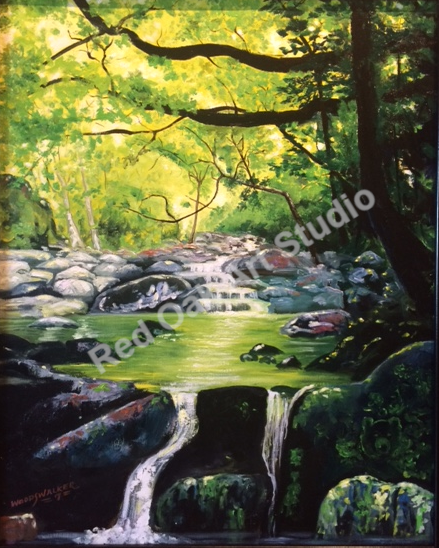 Established for nearly 20 years, I am displaying my original oil paintings,(commissions), Murals, and sign painting. Although at this time the only type of hand lettering and pinstripping I do is just for specialty type signs. Oil paintings of the natural world consisting of woodland scenes, rivers, animals both wild and tame are a strong love. 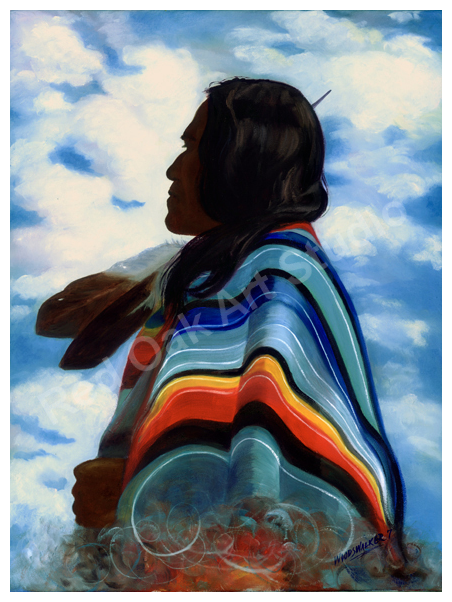 Oil Paintings of the Native American culture and people has been a real passion. 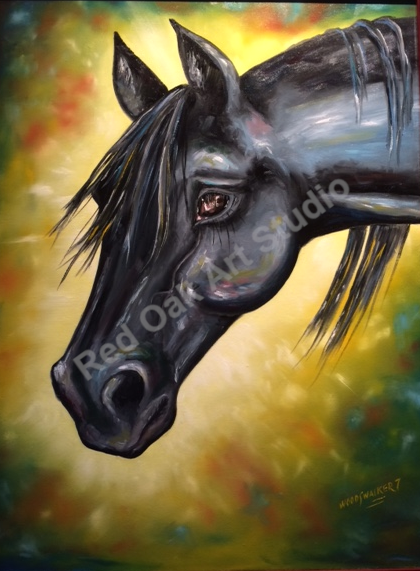 Red Oak Art Studio is located at my home south of Rosebud Mo. 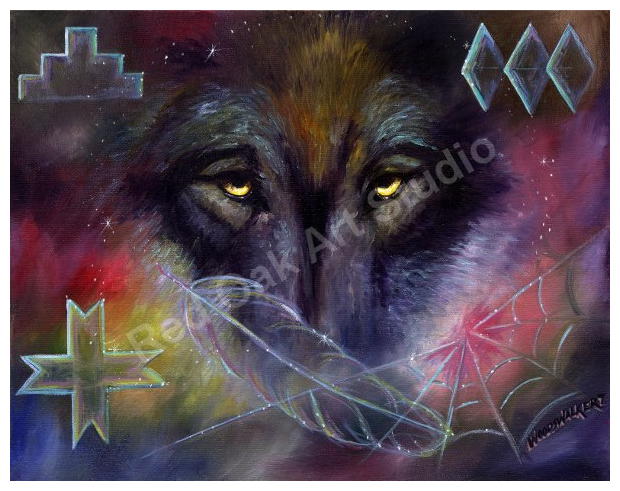 Painting is called "5 hidden Spirit Animals" Horse, turtle, wolf, bear, and eagle. Scene was from river near Cherokee N.C.
Includes a 2" wide black matting. 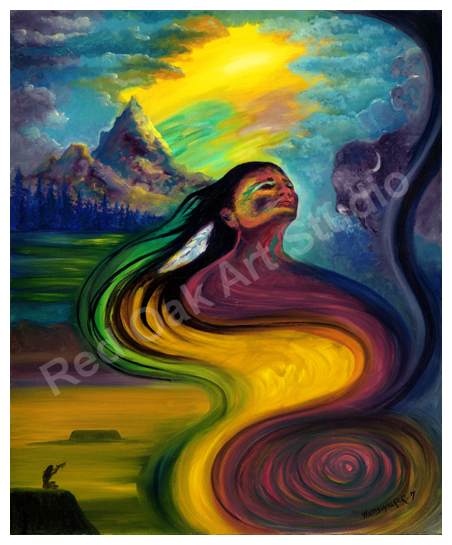 "Spirit Wolf" Painting is 18"x32" inches. Framed in a rich 4" wide dark wood frame. Price $800.00. 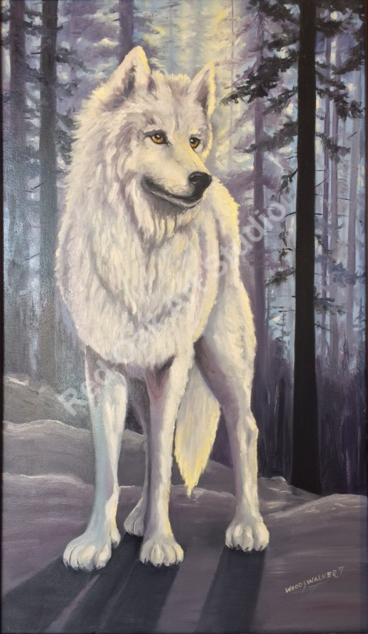 Painting done in appreciation of white wolf I seen at Yellow Stone National Park. Prints are 14"x24" inches set in a two inch wide deep purple matting. 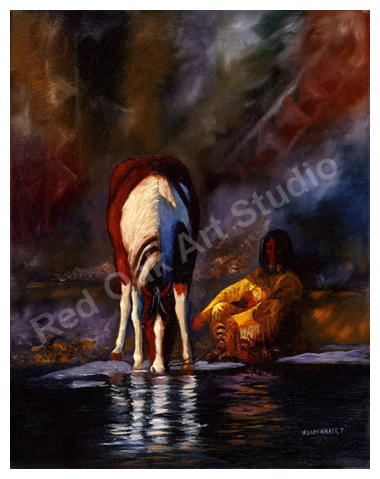 The horse one is entitled "Ebony's Spirit" size 21"x28" framed in a 2" inch wide mahogany wood frame. Wanted to capture the true spirit of a horse that I had for years. She was highly intelligent and had an incredible spirit for life. Notice the word reflected in her eye. Prints 11"x14" with a 2 inch matting. "Feather Medicine" Framed in Tobacco leaf covered frame with 2" white linen liner. Native Americans of old used feathers in their medicine practices to heal and understand what is going on in the body and soul of a persons makeup. I ave personally experienced the power of the eagle feather during healing sessions as I too practice this age old method of healing. 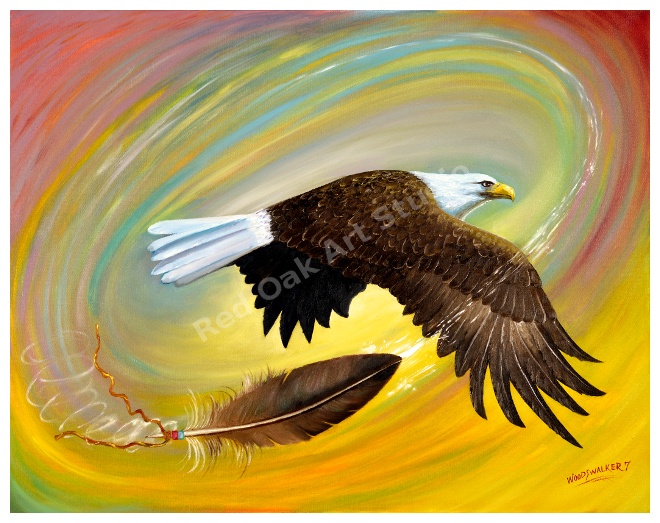 It was a privilege and honor to paint this depiction of the art of "Feather Medicine." Available in various colors of mats. "Sequoia Giant" Framed in a tobacco leaf covered frame with 2" white linen liner. Description: The Sequoia Giant trees, the largest trees on the planet, only grow in the U.S, in California, and Russia. Largest tree in the world at 36 1/2' in diameter. They grow only at an elevation of 5,000 to 7,000 feet above sea level. 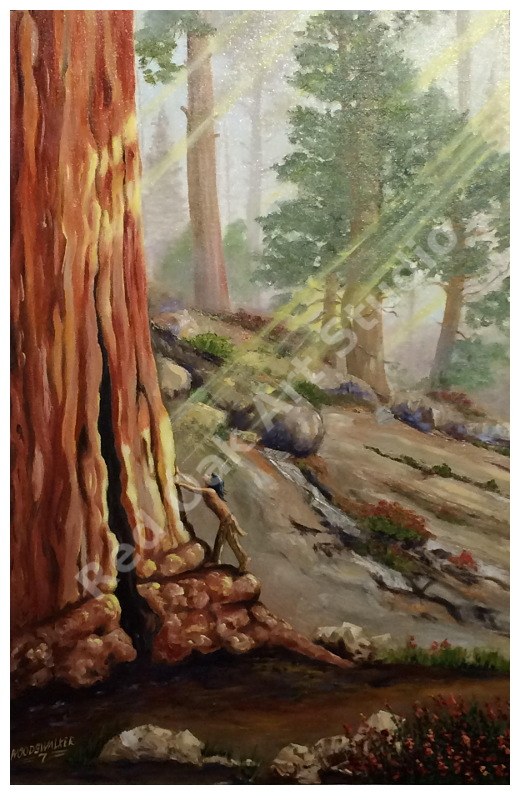 This is a depiction of a curious little Indian boy in utter admiration of the giant trees, a place he calls home. Colors of mats are either ivory or pale lavender. "The Awakening" is an an account of an age old practice of honoring the day at sunrise with prayer. This was also done at sunset, the two most powerful times considered by the Native Americans to connect to the Creator for answers in prayer. 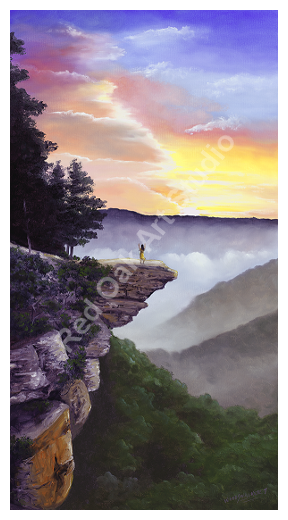 This painting was inspired from an actual location in Whitaker Point Arkansas where I visited this past spring. A ledge looks out over the buffalo River roaring below. Framed in a 4 inch wide spectacular Black Cherry Frame with a 2 inch wide white linen liner, expands the painting to a a stunning height of 44" and 27 inches wide. A jaw dropping spiritual piece of work that will warm any home with the rich sacredness of the earth and it's ancient peoples. Is the past really in the past or just in another parallel dimension that we live side by side with? If the veils between these parallel dimensions are thinning now as they say, is it possible to see things beyond the spectrum of normal consciousness? I think yes it is possible. This painting is framed in a beautiful 3" oak frame, with a 2 inch neutral linen liner. A wonderful conversation starter. This is a spell binding oil of the wolves of Eli Minnisota. Although these particular wolves are no longer with us, it shows the stark reality of the social status of the Alpha male or female. 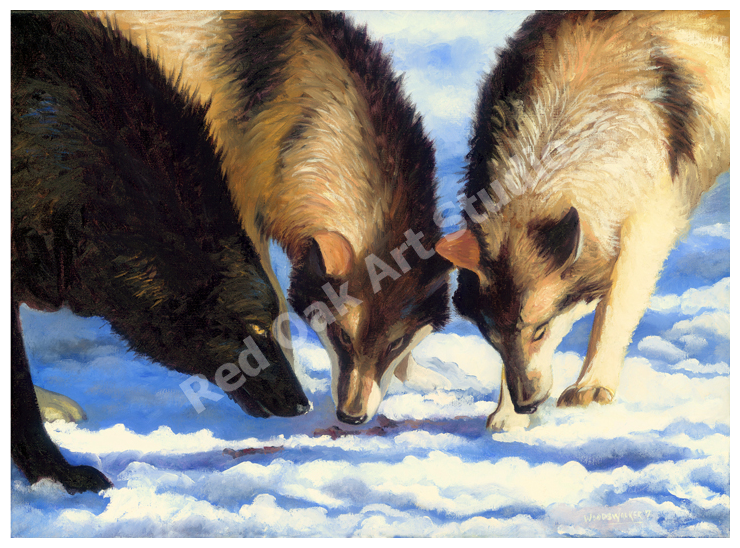 Beautiful highlights of the northern snows with sharp contrasts of the wolves, this painting is captivating surrounded in a 2" white linen liner and a 3" wide warm oak frame. 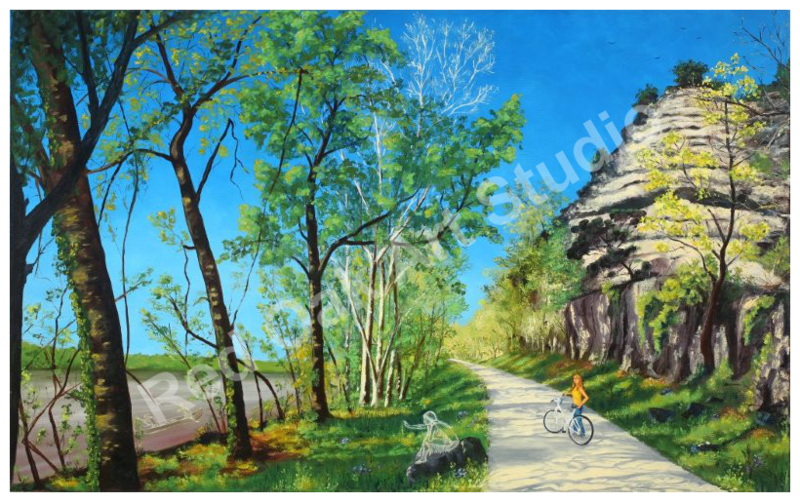 This Painting entitled "Cherokee NC" Was painted from a scene in Cherokee North Carolina. Sun drenched forests sends chills of inspiration. Notice hidden image of Cherokee presence. Framed in solid cedar wood 2-1/4" frame. Latest painting entitled "Night Freedom" is a wrap around canvas sized at 25"x19", with a 1 1/2 inch wide wrap around frame. 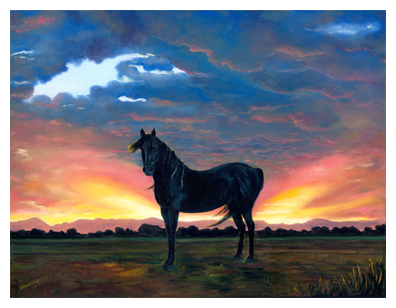 The scene depicts a magnificent, black as the night, horse set against an incredible Colorado sunset. Newest oil painting of a Full blood Cherokee. Original oil painting sized 18″ X 24″. Indeed, soul stirring to gaze upon this mystical profile of our nations past. Original oil framed in 3″ black satin finished frame. Very striking! Original oil sized 16″ X 20″, framed in 4 inch look of leather type frame in rich, warm maroon brown color and 1″ inch white linen liner. It brings light and warmth to any decor enriching your room. Original oil sized 40″ X 28″, rich golden colors of fall can bring sunshine to any room. 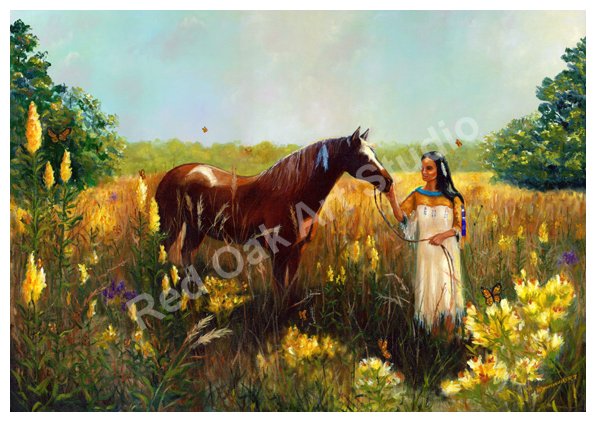 History of original prairies of Missouri and authentic style Indian dress. Framed in brown 4 inch wide wooden frame. 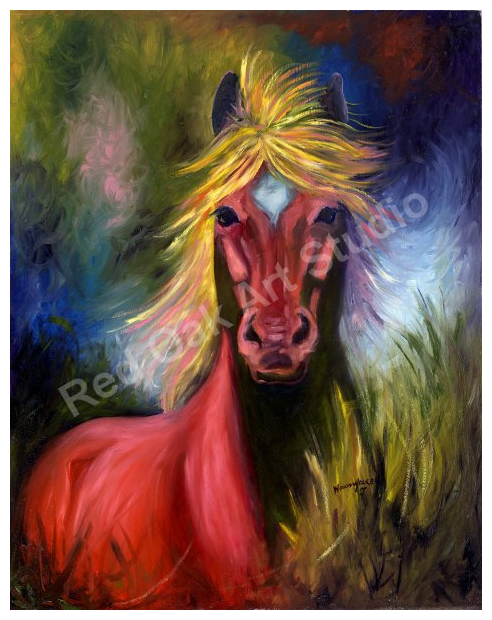 Painted with real love of horseflesh and an understanding of their fiery nature. Wild with color and energy. A deeply stirring account of the wolf and their golden eyes. Native American symbolism surrounds. None loved the land so much as the Native American. There are Keepers of the land present in certain places. This is an account of such a presence. Original oil sized 20″ X 24″, framed in a blue wood grained frame with a 2″ white linen liner. 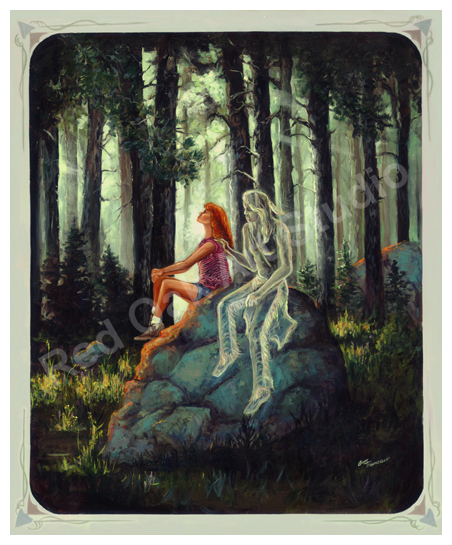 A spirit version of a dimensional flight of the soul, reaching back in time to places known and loved. Very pronounced and vivid colors. A painting for the bold of heart.